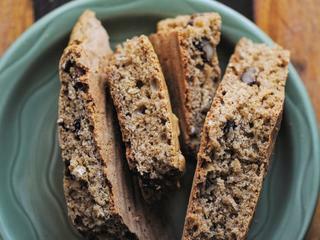 An easy, delicious and healthy gluten-free Irish Soda bread filled with cranberries and walnuts! Perfect for St. Patrick's Day or any occasion! Preheat oven to 375°F. Place a parchment paper lined cookie sheet or cake pan into the oven while it is preheating.Mix milk & vinegar. Set aside.Mix dry ingredients (flour through salt).Beat your eggs into the milk & vinegar you set aside.Pour butter into dry ingredients, combine well.Pour remaining wet ingredients (egg-vinegar-milk mix) into your dry ingredients.Add the cranberries & walnuts to your batter & mix until just combined.Remove your parchment lined baking sheet/cake pan from the oven.Pour the batter onto the parchment, and using a spatula and/or your hands, quickly shape into a rounded dome. Then, using a serrated knife, slice an "X" into the top of batter.Place in the oven & bake for 35-40 minutes, or until golden, and a toothpick inserted into the center comes out clean.Let cool before slicing.Enjoy!